Wholly Moses! 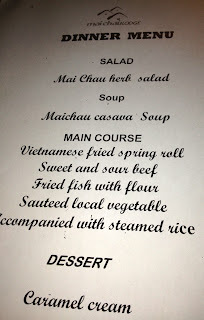 : Vietnam adventure- Day 5- Goose attack and luxury at last! Vietnam adventure- Day 5- Goose attack and luxury at last!! Vung is getting married. "How exciting!" I exclaimed in true girly style, (OK, so i don't want to get married myself, but I'm allowed to get excited about OTHER people tying the knot, right?) "when? ", I asked. "I don't know" he replied. Turns out that in his culture, they only tell their friends and family a few weeks beforehand and the brides' family organises everything...literally all he has to do is turn up! I think the UK marriage rate would be a lot higher if this was OUR policy. City weddings last just a few hours, with a ceremony and then drinking and dancing. But country weddings are up to 3 days, with parties, one for friends, one for family and then a joint one...and they even kill some animals for it. And the friends bring all the food and drink and decorate the house. Sounds bloody perfect to me. First stop was Son La prison where the French had put the Vietnamese resistance fighters and revolutionaries. Again, as they were defeated, they had destroyed most of the original building, in which up to 300 prisoners were held at any one time, but so e of the buffing had survived and the rest, on this occasion, sympathetically rebuilt according to plans left behind. After we had walked around Son La Museum- another government building that has as much propaganda as it does items of historical interest, we began our drive to Mai Chau, with the plan to stop in several villages for "sightseeing" on the way. First stop was a simply stunning traditional Vietnamese village- home to the White Thai tribe. The entrance to the village was across a VERY rickety bamboo bridge. Fine. Except under that bridge was a very wide, very deep river. One of my irrational fears (shortly behind spiders) is bridges over water. Add in that I am still on a crutch and my Wally Boot makes it rather difficult to grip, and you will understand why I was nervous. We walked slowly and steadily across, and I had to give Vung my crutch after it went trough the bamboo after a few steps- everything was fine, until the middle, when a bloody, sodding moped came speeding up behind us- we moved to the side, the whole bridge swing and I panicked, lifted my bad foot up and pulled it in the wrong direction. Ouch I said. Well, I didn't say that and there is no need to repeat what I said- my mother will read this blog, but suffice to say that Vung now has a few words added to his English vocabulary. But it was worth it- a picture perfect White Thai tribe village- bamboo houses on stilts, Buffalo pulling along supplies and lovely Vietnamese children running up to say hello. One thing I am very happy to report is that children here are allowed to be children- they aren't turned into beggars like in some other third world/developing countries- I remember in Tanzania, you couldn't make eye contact with the kids for fear of them putting their hand out. In Vietnam, they want to talk to you (in their own language, of course), to touch you and to show you things- and when you leave, they wave goodbye and smile at you- full of joy just to have met someone from out of town. One of the bamboo houses had recently been built. Vung explained that once a family has saved and bought, bit by bit, all of the materials to build one- it only takes two weeks to get it finished- the whole village pitches in until the final tile is laid on the roof. Now that's good neighbours! As we walked through, Vung was attacked. By a Goose. It flew at him and tried to peck him (do Geese peck?? ), he launched into several impressive martial arts moves, but simply looked ridiculous fighting this massive bird. Doubled up laughing, I could do nothing except offer him my crutch as defence. Finally a local farmer came and shooed him away, but the damage was done...we laughed all the way back to the car- and then showed the video, that I had helpfully been taken whilst he was defending himself, to Kin, who couldn't drive for 10 minutes afterwards as he was laughing so much. It was a great moment and I think it helped Vung to relax a little bit with me. Another hour on the road and then we stopped at a roadside stall, where one of the Black Thai ladies was selling some very unusual looking fruits- they looked like giant lemons- I still haven't got to the bottom of what they were. She was also selling birds in cages- nightingales and others I didn't recognise. The people here live off the land in the real sense- and the government, well, say what you like about a Communist government, but this one not only protects the minority tribes, but encourages their way of life. For example, education is not free in Vietnam, but it is provided free to the tribal children for the first 5 years to ensure that they have some basic education before their parents set them to work on the farms or marry them off to another village tribes person. Back in the car and we stopped at the Moc Chau general store, an hour down the road. For lunch. The store acts as a meeting point for the locals an a place to get supplies- we sat down up the top on a mezzanine floor and were served the best food I have had since being here. A melt in the mouth chili fried beef, the ever available cabbage with a boiled egg and soy sauce dip (better than it sounds! ), light spring rolls, that, unlike the British version are more filling than wrapping, with a chilli and spring onion dipping sauce, a sweet potato and pork Pho, sticky rice, a sweet and sour pork knuckle dish and a plate of crisp, fresh green salad with coriander. All the produce was bought from the local market- our next stop. And then something odd happened- a local man came and sat next to me with a bottle of rice wine- his group of 15 friends (and his wife!) looked on whilst he asked me, through Vung whether he could share a drink with me as I was the most beautiful woman he had ever seen in the flesh and the first western woman to pass through the area and stop for dinner in quite some time. And he was impressed with my chopstick control. Apparently. Embarrassing. But, flattered, I of course agreed- we clinked our shot glasses (after a lengthy speech which Vung DIDN'T translate, but made him blush), and then, just in case it wasn't weird enough, he asked to take some pictures of us together- his wife took the bloody picture!!! Kin commandeered my phone and took a few too- and then one by one, they all wanted one. Very odd, but great for the ego. I felt like Britney Spears... except without the massive drug problem and the cash. Our final stop before Mai Chau Lodge was at another village market- all the usual produce was on display, plus a fish "stall"- with live cat fish being killed as needed and scaled and filleted for the customers at request. The meat stall was interesting- nose to tail eating is the norm here rather than something championed by fashionable TV chefs, and pigs ears, trotters, cows brain and other delicacies were being snapped up. It was a bit like being down Rye Lane in Peckham, but without the disgusting people. Women from the tribes came up to stroke me and Vung translated that they thought I was a movie star- I could get used to this- any more of this flattery and I won't be able to get my head THROUGH my hotel door! The fact is, they don't see westerners very often- I know this to be true as I haven't seen one in 3 days since I left Hanoi- and there it's just the standard backpackers, so they don't venture out of the cheap bars to see much of real Vietnam. Next stop, my hotel. Before I left the UK, I had high hopes for this place, but after the last few days, I wasn't so sure. But thank God, and Allah and Buddha and Elvis.... it is PERFECT. There is no such thing as barefoot luxury in Vietnam- this isn't Thailand, it has not quite got it's tourist hat on yet- and that is what makes it beautiful and fascinating and real- but it also means that some of the hotels are anything but a pleasant, relaxing experience. But Mai Chau Lodge is different- it IS geared towards travellers, but in a sensitive manner. 90% of it's employees are from the local tribes, they are educated and trained to work there- but not to the extent that they have to leave their culture behind. I was shown to my room, and promptly burst into tears in front of the receptionist, who had no idea what was going on, but gave me a hug and booked me a massage in the bamboo hut with one of the Black Thai women for an hour later. They were tears of relief- it's no wonder sleep deprivation is used as a method, a very successful method, of torture. I looked at the crisp, clean sheets, the clean wooden floor, the shower room where they had set up an oil burner, burning tea tree oil made by a local family, the bottle of water by the side of the bed and the complimentary bottle of rice wine on the stand by the fruit tray, and couldn't believe the difference from the last two nights. If I can just get a full nights sleep, maybe I will stop bawling like a hysterical woman with PMT every 5 minutes. I had a full body massage (for £12), avoiding the poorly foot and then spent a couple of joyous hours reading in my room without having to keep my full body covered to avoid the mosquitoes and dirt that I have been surrounded by for the last 4 days. Moses, you need to man up. Dinner was in the lodge restaurant- a beautiful bamboo hut (see a pattern here?) 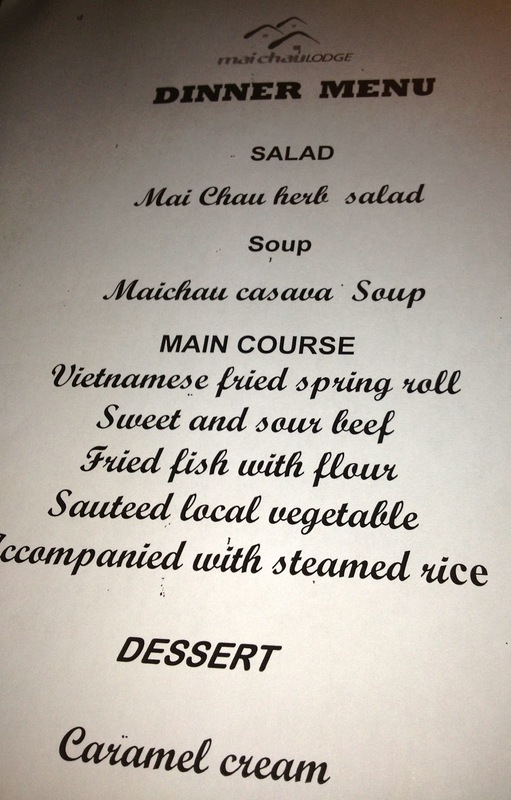 and consisted of a fresh herb and chicken salad, casava soup (sweet potato like vegetable), and then a selection of Vietnamese dishes- the best of which was the lightly fried fish with spicy peppers. And they had wine. Good wine. Not great, but good. First glass of good wine so far this trip. What a joy. Tomorrow I was supposed to be trekking for 4 hours in the morning and cycling for several hours in the afternoon. As I am still unable to comfortably shower without fear of hurting myself, that is obviously out. However...I AM booked on a cookery course, so it's early to bed ready for the market tomorrow morning- I have to go with the chefs to buy the produce and plan a menu before I start to cook it!